This post from November 10, 2015 about StaffPad for Windows 10, the updated version of the app, with new features. This post from April 7, 2016 with new features. StaffPad is, quite simply, the most fun, innovative, and groundbreaking music notation software available today. The app is available exclusively from the Windows Store for $70. 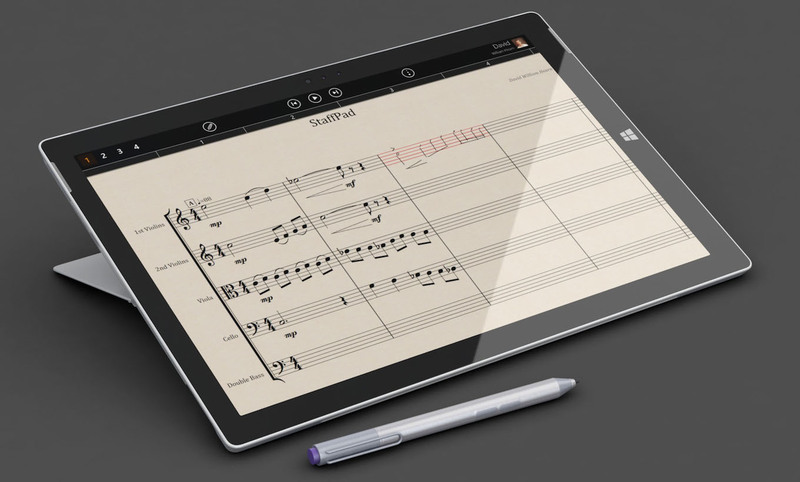 The only platform on which StaffPad is currently available, for reasons that we’ll soon explore in detail, is pen-and-touch based Windows 8 tablets like the Surface Pro. …OK, maybe just a little, for some brief history: In early 2013, a start-up called ThinkMusic caused a sensation by releasing a promotional video for an iOS app that recognized handwritten music. 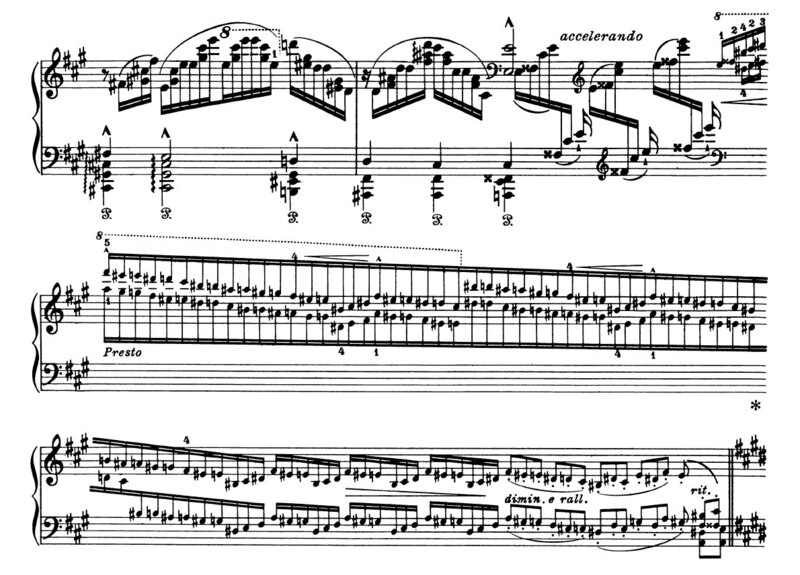 The video was later discovered to be a series of screenshots from Sibelius and GoodReader, and was ultimately used as a fundraising tool for an app that never materialized. Nevertheless, the buzz demonstrated the intense interest in such a product, if one ever were developed. Then in October 2013, Neuratron introduced a beta version of NotateMe, a new music handwriting app for iOS and Android devices, with an official 1.0 release two months later. Having years of experience with music recognition technology via its PhotoScore desktop software, Neuratron was naturally positioned to enter the mobile space with a related product. Since then, Neuratron has released version 2 of NotateMe and has integrated PhotoScore directly into the mobile app, via an in-app purchase. If you use NotateMe, you are aware of its strengths and its shortcomings. Writing something naturally and seeing it instantly converted into typeset notation is nothing short of magical — when it works. It can be disorienting, though, to see your scribbles interpreted by NotateMe in real-time when the interpreted result is not what you intended. Because a split-screen is required — you write music in one staff and it appears, somewhat disconnected from what you entered, above your entry — you can only view a relatively small portion of your music at a time. The non-native interface is, to me, visually unappealing compared to many modern apps. However, with practice, NotateMe is a useful tool for jotting down brief musical ideas and sharing them with yourself or others for later use, thanks to its built-in MIDI and MusicXML support, especially if the only tool you have with you at the time is your smartphone. 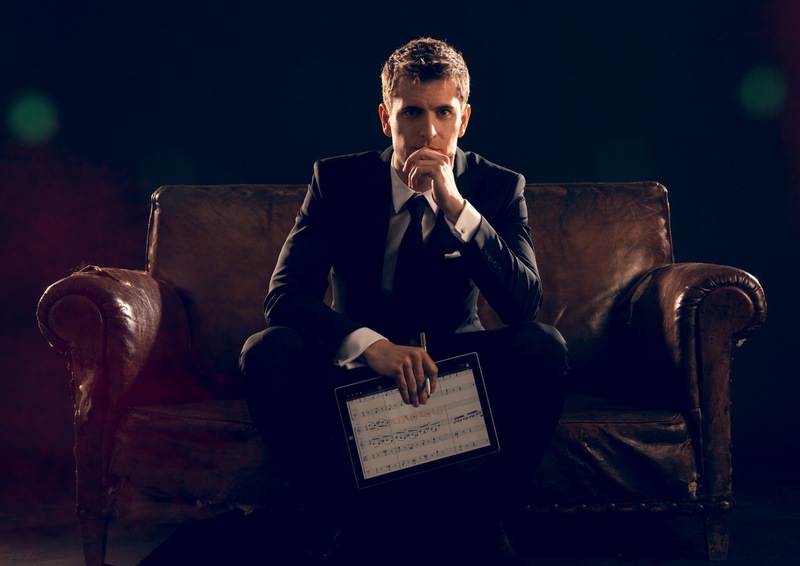 During this entire time, and even well before the ThinkMusic video appeared, composer, orchestrator and programmer David William Hearn was thinking a lot about musical notation and its relationship to the digital, mobile world. (You can read a longer interview with David on this blog.) David is no stranger to the world of music technology; indeed, he’s done some high-profile work in music for film, TV, advertising, and the stage, including working as music editor and programmer on the film adaptation of Les Misérables — a particularly challenging task, given the nature of that film’s live recording process. He’s also one half of the team behind the Cinematic Strings sample library for Kontakt. Those three years of work have finally seen the light of day today. I’ve been working with an advance build of StaffPad for a few weeks now, so let’s take a detailed look at it.